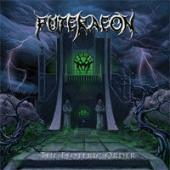 More old-fashioned than ancient times… Gothenburg band PUTERAEON has released three demos prior to this album. Things have sure moved quite fast for the lads. Vocalist/guitarist Jonas Lindblood´s penchant for the horror movies of the 80´s combined with the band´s love of Old School Swedish death metal seems to be a winning mix. Quite a few of the tracks are pinched from old demos, but refreshed in the arms of Andy LaRocque at Sonic Train Studios. Rot and phlegm galore and imagery on the side. What PUTERAEON has achieved is real Old School death, no additives. Tracks like “The Innsmouth Insanity”, “The Extraordinary Work of Herbert West” and “Re-Animation” got me in the mood before I even played them. If you by chance don´t dig the death metal of old, and want various kinds of infusions, you can leave this review right away. But if you like meaty raw death with a taste of blood you´re in the right place. The downside is that the blurry and typical vocals can get on your nerves before the closing track. Otherwise, I guess I liked the atmosphere and the drumming. But I still wonder if I need to replace any old heroes with this band, to be or not to be… Give them a chance; they have the best intensions and a lot of experience in the genre.